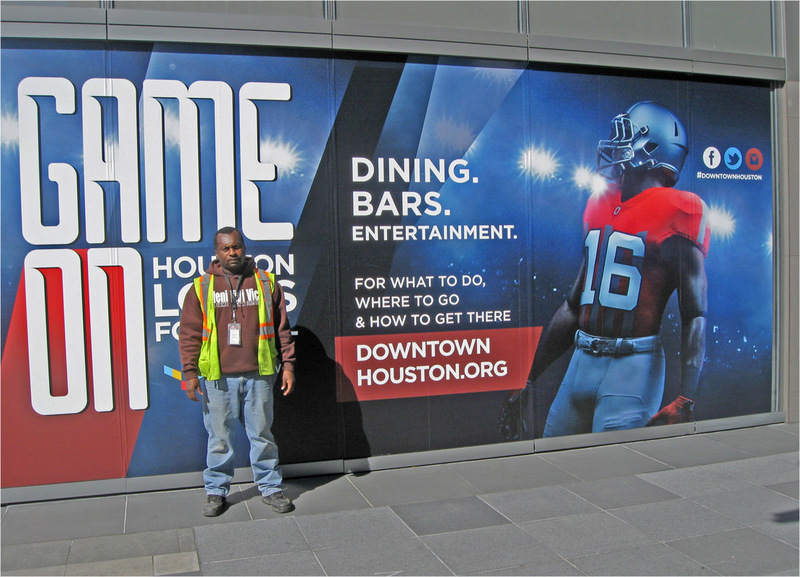 HOUSTON (CN) – Houston is buzzing with Super Bowl events, but some observers wonder if it’s just the latest town to be gamed by NFL demands for concessions from host cities, despite the league’s $13 billion in annual revenue. New England Patriots quarterback Tom Brady could make another mark in the record books Sunday against the Atlanta Falcons. A Patriots victory would make Brady the winner of five Super Bowls, the most ever by an NFL quarterback. Brady has a few local fans. 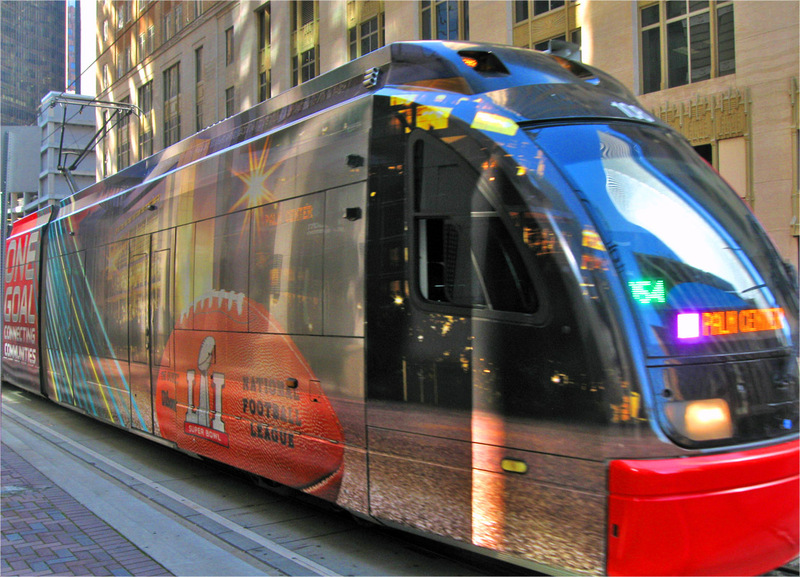 An elderly black man leaned against a cart this week as he inched it up onto a light-rail platform downtown and enjoyed some friendly smack talk with a Falcons fan. “I love Tom Brady! I call them the Brady Bunch. I used to live for the weekend, but now I live for Sundays. I’m living just for Sunday. I don’t want the weekend. You can have the weekend,” he yelled. His antagonist William Anderson, a 42-year-old longshoreman who works at the Port of Houston, pointed to the sky. “Hey, get out the way! Watch them wings up there, man! It’s a bird flying and he sees something about to die. I’m going to lose my job. I’m not going to work Sunday. I’m going to watch Atlanta bust these folks up, man,” Anderson said. The Patriots fan didn’t seem concerned. “I’m going to watch the Tom Brady show. You know that story, ‘The Brady Bunch.’ That’s the way we all became the Brady Bunch,” he sang. An informal poll of Houstonians showed most rooting for the Falcons, with many saying they’re tired of seeing the Patriots in the final game. Led by Brady and taciturn, hoodie-wearing head coach Bill Belichick, Sunday’s game will be the Patriots’ seventh Super Bowl appearance since 2002, with the team posting a 4-2 record behind the duo. It may be a case of sour grapes for Houstonians, because the Patriots beat the Houston Texans in the second round of the playoffs this year, as they did in 2013. The Falcons have never won a Super Bowl. They come into the game as 3-point underdogs, but are capably led by veteran QB Matt Ryan. A favorite for this season’s MVP award, Ryan hasn’t thrown an interception in six games and had a 14-yard rushing touchdown last week against the Green Bay Packers, his first rushing TD since 2012. The Houston Super Bowl Host Committee signed up 10,000 volunteers to staff a 10-day NFL Experience event at a downtown convention center, this for a league that expects to report $13.3 billion in revenue for 2016, according to Forbes magazine — up more than 50 percent since 2010. Commissioner Roger Goodell has said he aims to lead the NFL to annual revenue of $25 billion by 2027. The lion’s share of the money comes from television deals. At the NFL Experience in Houston, players are signing autographs, fans compete in punt, pass and kick contests and coaches are putting on football clinics for kids. Tickets are $35 for adults and $25 for kids 12 or younger. Houstonian Elliott Spruce said the entrance fees aren’t worth it. “My son’s only 5, so he wouldn’t even remember it if I took him,” Spruce, a realtor, said. Host committee volunteers Kelley Sullivan and Duchess Ferguson were all smiles outside the volunteer headquarters downtown this week. Ferguson, 48, her gold front tooth and gold hoop earrings with the word Diva filling the hoop glinting in the sun, said she recently moved to Houston from Port Arthur, 91 miles east of town. “It’s just something to do besides doing nothing. You know, helping other people, showing them that Houston can be amazing and we’re not all crazy like they think we are,” she said. The self-proclaimed Energy Capital of the World, a nod to the more than 3,700 energy companies headquartered here, Houston has a well-earned reputation as a sprawling, traffic-heavy metropolis that pays lip service to public transportation. Metro buses with few or no passengers on them are a common sight here, amid bumper-to-bumper solo drivers on Houston’s crisscrossing freeways that can overwhelm the unfamiliar. But lifestyles are changing here. Blanket fat jokes no longer apply. The drilling boom that petered out when the price of oil fell precipitously in 2014 fueled construction of several apartment complexes and new skyscrapers downtown, where 150,000 people work each weekday, with cranes seemingly on every block during the height of the building frenzy. A new downtown entertainment district by an 11-acre park and the convention center replaced street lanes with walking paths. The Discovery Green Park is hosting a free NFL village this week with a NASA “Journey to Mars” virtual reality ride and dozens of bands. The city recently installed two new light rail lines downtown and Bayou Greenways 2020, a public-private partnership, is acquiring land for 3,000 acres of linear parks around city bayous with the goal of building a 150-mile continuous bike trail around Houston proper. Houston leaders are casting the Super Bowl and the accompanying infrastructure improvements as a springboard to a more vibrant city, which is already the most ethnically diverse in the nation by some measures. The host committee, which helped the city beat out Miami’s bid to host Super Bowl LI, commissioned a study that projects Super Bowl festivities will draw 1 million people, 138,000 from out of town, and generate $350 million in new spending. However, Houston’s ABC affiliate reported this week that Houston and Texas taxpayers are picking up a large chunk of the tab for this week’s NFL events. The host committee paid $62 million to rent the George R. Brown Convention Center for the NFL Experience and Minute Maid Park, the Astros’ home field, which hosted a media event Monday for Super Bowl players. The committee is also prepaying the Houston Police Department’s $5.5 million in overtime for patrols of the events. ABC reported that taxpayers are footing 42 percent of the bill, $26.4 million, even though the NFL gets the all the money from ticket sales to the events. Richard Campo, chairman of the host committee, downplayed the taxpayers’ tab and said the projected $350 million infusion into Houston’s economy will offset it. “To me it’s about putting a zip in Houstonians’ step and having people in Houston think this is a world-class city to live, work and play,” he told ABC. University of Chicago economist Allen Sanderson said he’s reviewed several economic-impact studies for past Super Bowls and Olympics and he never trusts their projections. “I think it’s a reasonable rule of thumb, as a basis for starting the argument or the discussion, that you take whatever number they give you and move the decimal point once to the left. That’s probably pretty close. So if they want to say its $500 million, I think it’s $50 million,” he said in a telephone interview. Sanderson said a Marriott hotel, for example, might charge $400 a night for a room for the Super Bowl, but only $100 or $150 stays in Houston; the rest goes to Marriott’s corporate headquarters. Some locals who will get to keep most of their proceeds this week are people renting their homes through Airbnb, which charges renters a 3 percent service fee. Checked Tuesday, prices ranged from around $200 for one room of a two-bedroom apartment two blocks from the game site, NRG Stadium, that the renter says can comfortably fit three people; to $10,000 a night for a 4-story townhome with two bedrooms that can accommodate 10 guests. There were 306 Houston listings on the site Tuesday. Houston taxpayers paid $289 million, 72 percent, of the $352 million building costs of NRG Stadium, which was financed through sale of bonds that are being paid back mainly with hotel occupancy and car rental taxes. “Football stadiums are probably the worst public investments you can make. … They aren’t used very much. They’re closed most of the time,” the economist said. NRG Stadium may be a better public investment than some other NFL stadiums because it hosts the Houston Livestock Show & Rodeo for three weeks every March, plus concerts and monster car shows. Sanderson said the NFL demands and gets concessions from Super Bowl host cities. 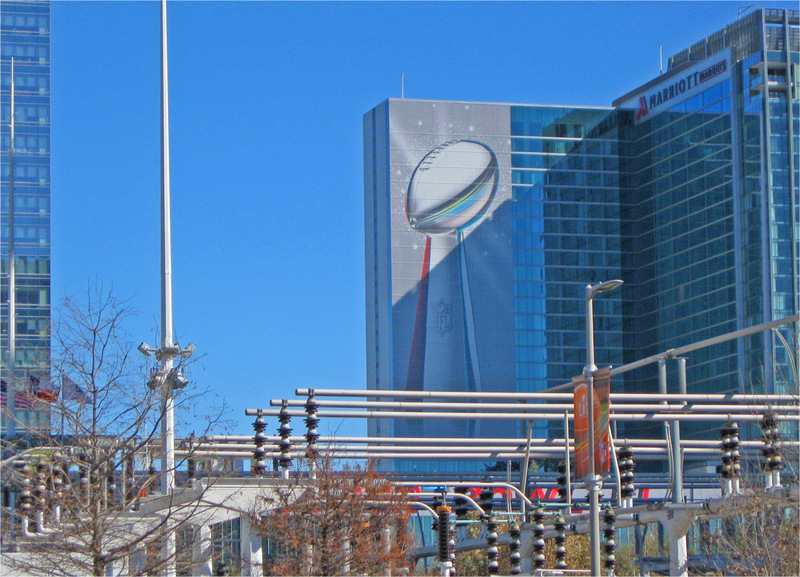 The Houston Super Bowl Host Committee, for instance, is paying for the players’ hotel rooms and their catered meals. The NFL can demand such perks because it’s a monopoly and can play rival cities off one another. Despite the uncertainty of the game’s economic impact on Houston, there’s no doubt it’s raised the city’s national profile. Lady Gaga will sing the halftime show and Bruno Mars and Taylor Swift perform Friday and Saturday at Club Nomadic, a traveling nightclub that was scrambling to get permits Wednesday from city officials who assured local media the shows would go on. Arthur Howard, a 54-year-old homeless man, often seen in a black winter jacket around Houston’s federal courthouse, said he plans to stay away from the festivities. Tucking a Sports Illustrated into his jacket pocket to chat with a passerby, he said he doesn’t feel comfortable enough with his appearance to be around the crowds. He planned to rent a hotel room, get cleaned up and start looking for work, but someone stole his bags, which contained most of his possessions and all his money. “I’m probably going to go for Atlanta and see how they do, if they can make it a good game. But you know how New England is, man,” he said.